... not to mention the drinks industry and disruptive start-ups. Read more about Aileen Mathieson’s eclectic career. What does 2019 hold for financial services? 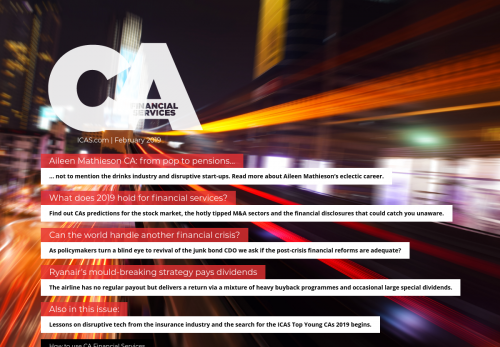 Find out CAs predictions for the stock market, the hotly tipped M&A sectors and the financial disclosures that could catch you unaware. Can the world handle another financial crisis? As policymakers turn a blind eye to revival of the junk bond CDO we ask if the post-crisis financial reforms are adequate? The airline has no regular payout but delivers a return via a mixture of heavy buyback programmes and occasional large special dividends. Lessons on disruptive tech from the insurance industry and the search for the ICAS Top Young CAs 2019 begins.